MAMMOTH MASS Weight Gainer provides more protein, better carbs and far less sugar giving you more of what you want in a potent mass muscle building formula. With 60 grams of the finest whey protein isolate, whey protein concentrate, micellar casein and calcium caseinate available, combined with the MAMMOTH Clean Carb Complex featuring Quinoa, Sweet Potato, Rolled Oats, it will have you primed with clean quality calories for MAMMOTH gains! 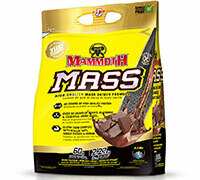 Featuring a revolutionary carbohydrate matrix of Quinoa, Sweet Potato, Rolled Oats and Low Glycemic Maltodextrin, along with the power and potency of high quality MCT’s, MAMMOTH MASS is by far the most advanced and complete Mass Muscle Weight Gainer for those looking for more than just hitting the BIG TIME, but the MAMMOTH Time! Suggested Use: Blend 4 scoops (320g) of Mammoth Mass with 20 fl.oz (591 ml) of water. 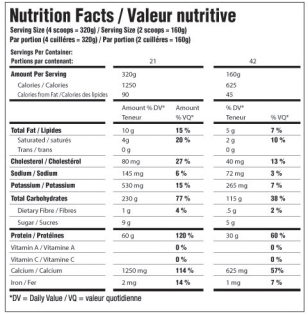 On training days take 1 serving for breakfast and 1 serving post workout. On non training days take 1 serving for breakfast and 1 serving in the afternoon.